Gwyneth Paltrow and her lifestyle brand Goop have gotten a lot of flack over the years for being over-the-top, only featuring products with a hefty price tag, and appealing to the new wave of non-crunchy organic lovers who prefer stilettos over Birkenstocks. 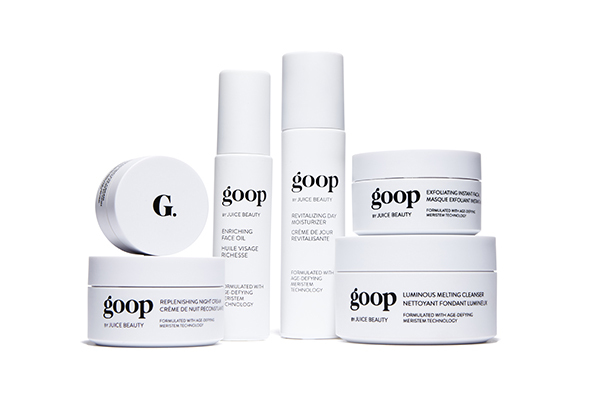 So when Paltrow teamed up with Juice Beauty to launch a new beauty brand aptly named Goop Skincare, we expected nothing short of expensive organic products that we’d somehow feel instantly fancier using. What we got was all that and more. Before you roll your eyes, hear us out. Yes, Goop Skincare does pack a big price tag, but the collection of six products are not just your run-of-the-mill fancy face creams and oils. These are mostly organic (73 to 99 percent) products that not only look amazing on your vanity—hello, minimalism—but they’re actually good for your skin. All six products are made with various vitamins, oils, plants, and flowers. The range consists of a daily cleanser, an eye cream, an exfoliant, an oil, and a day and night cream to cover your skin care essentials. Although it’s hard to pick a favorite among the bunch, we find ourselves religiously—and honestly eagerly—applying the Luminous Melting Cleanser ($90, goop.com), Enriching Face Oil ($110, goop.com), and Replenishing Night Cream ($140, goop.com). Following our latest obsession with cleansing balms, it’s no wonder we’re obsessing over Goop’s melting cleanser, which is thick and gloppy (it’s a good thing, trust us) and requires a cute little spoon to scoop out. Simply rub the buttery cleanser all over your face and watch it literally melt into an oil cleanser that’s incredibly slick and velvety. (Just a heads up to remove your makeup prior to applying the balm as it’s not quite ideal for mascara removal.) Top of with a splash of water to dissolve the oil. Honestly we could end our skin care regiment there—but what fun would that be? Next we’ve taken to applying a pump or two of the face oil all over. Formulated with vitamin E, sweet iris, poet’s daffodil, sunflower, olive, linseed, and jojoba seed oil, this truly is one of the most nourishing oils we’ve tried. Although not quite a dry oil, there is some magic as work here as the product does miraculously sink in within seconds. Although we prefer applying this oil at night, it is truly light enough for day wear. Lastly, we’re following with the night cream—which we can only describe as frosting for your face. We know that might sound a bit odd, but the texture of this formula reminds us of our favorite homemade buttercream icing. It’s light and whipped, yet full, rich, and butter-like. With a whole slew of active ingredients, this cream not only hydrates while you snooze, but it also boasts plumping, brightening, and firming benefits overnight. Let’s just say in the time we’ve been applying, we’ve woken up to noticeably hydrated, smoother, and all-around happier skin. Of course if you’re still on the fence about Goop Skincare (but we promise we’re not pulling your leg with this one), you can always opt for The Discovery Set ($125, goop.com), which consists of travel sizes of the day moisturizer, face oil, night cream, and exfoliator, so you can test the waters for yourself. Bottom line: You’re not just paying for the Goop name and the satisfaction of knowing Gwyneth Paltrow is using the ~same~ products as you with this line. You’re paying for good ingredients and products that work. And to us, that’s totally worth drinking the Goop juice.